The Open Textbook Pilot grant program, which was established March 2018, set aside $5 million in funding to aid professors at universities in transitioning to open educational resources. Specifically, the grant would be awarded to institutions which promote the use of open textbooks, which are free online alternatives to traditional printed textbooks. One of the institutions included in the grant is Prince George’s Community College, located only 15 miles away from the University of Maryland. The college will be receiving funds from the $4.9 million that will be awarded to the other institutions included in the consortium. Students at Prince George’s Community College can access open content through OASIS, a search tool that allows students to search for open textbooks and other materials online. All of the content included in OASIS is under a Creative Commons license, which allows the work to be distributed and shared among students for the purpose of having students be able to access free online materials. With such an efficient and cost-effective resource being established for students at Prince George’s Community College, the question has been raised by University of Maryland students: why can’t UMD adopt a similar structure for using open educational resources? Student groups, especially MaryPIRG, have been working to promote these open educational resources on campus. 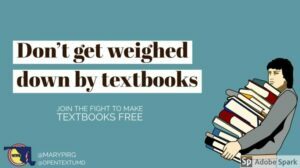 MaryPIRG’s “UMD Campaign for Open Textbooks” aims not only to increase faculty and administrative awareness of the textbook affordability issue, but also to work for the complete adoption of open educational resources at UMD. Members of the campaign have been holding weekly tables to collect petitions from students regarding textbook affordability and adopting open textbooks, which they hope to present to the administration in hopes of demonstrating a broad base of student support on the issue. For campaign members, it is especially frustrating to see another Maryland university adopting open educational resources, while UMD lags behind on taking action. The campaign and recipients of the grant tout the benefits of using open educational resources, such as keeping educational costs low for students, having access to course materials at the start of the semester, and being able to look at course content past the completion of the course (as these resources don’t expire). There are also benefits for professors who adopt open textbooks, such as being able to edit the open content that they are using, as it is under an open license, to best fit the needs of the course itself. With these benefits in mind, and the successful adoption of open educational resources at institutions like Prince George’s Community College, plus mounting student support of Open Textbooks, the University faces critical questions of viability and implementation into classes in College Park.